The vast majority of large enterprises still employ waterfall development processes for creating and launching new products and new lines of business. This is what a waterfall process looks like. 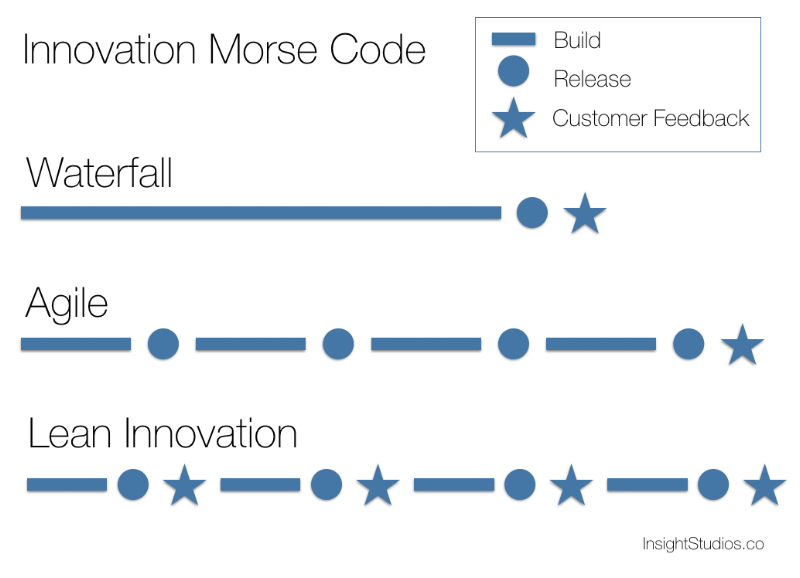 If this looks like your process, then you are following a waterfall approach to innovation. A waterfall process focuses on execution. It assumes that you know what customers want, you've developed an awesome business plan, and now all you need to do is execute the plan. The problem is, your plan is probably wrong, or a least part of it is. Within any plan, there are thousands of assumptions. Of course, you had to make these assumptions to develop your plan. However, if any of your big assumptions turn out to be wrong, then your business will fail. No amount of execution can fix it. The solution to this problem is to abandon your waterfall approach completely and replace it with lean innovation, a more entrepreneurial approach based on lean startup and design thinking principles. Lean innovation is dramatically different than waterfall in that it validates business model assumptions by continuously running customer experiments in the real world to determine which assumptions are true, and which are false. When new insights are uncovered, the team iterates by changing the business model to capitalize on this discovery. The result is an improving business model that continues getting stronger until the business achieves hyper-growth. The illustration below shows how different a waterfall approach is compared to a lean innovation approach, in terms of customer feedback and the insights uncovered in the process. Of course, not every new idea will ultimately be successful. No process has a 100% success rate. But, even when an idea meets with failure, it does so more efficiently with lean lnnovation than with a Waterfall process. This clears the slate and allows new, more promising ideas to come to the forefront. So, whether your project ultimately succeeds or fails, a lean innovation approach gets you there more quickly, more accurately and more efficiently. We developed a proprietary method of lean innovation called Insight-Driven Iteration. It's a proven approach for creating a disruptive business model, achieving product-market fit and finding a scalable, repeatable business model for new ideas. Our methodology has been proven across hundreds of different startups and more than ten different Fortune 500 companies. The best way to learn our Lean Innovation process is to participate in our Three-Day Bootcamp. Bootcamps are designed to create lean innovation practitioners within your organization. Based upon experience coaching hundreds of startups and entrepreneurial teams inside the enterprise, our curriculum helps participants immediately apply what they've learned to real-world problems. Bootcamps teach lean innovation principles such as consumer development, rapid experimentation, and business model development. Experienced InsightStudios EIR’s (Entrepreneurs-in-Residence) mentor and guide teams throughout the event, providing personalized coaching and support along the way. Our recommended starting point is our Three-Day Bootcamp. During this immersive experience, your team will assemble into startup teams of 4 to 5 people. Each team will operate like a startup for the duration of the Bootcamp. You will learn how to define your business model assumptions, develop well-crafted customer experiments, run these experiments, analyze results, and decide whether to pivot or proceed with your business model. During the three-day period, each team will run five different experiments with real customers in the real world. The insights gained during our intense and exciting Bootcamp will blow your mind. How to reduce risk by identifying the "minimum viable product"
Our 90-Day Accelerator is the best way to apply the training you learn in the Three-Day Bootcamp. The Accelerator is beyond introductory principles and is focused on delivering business impact. With the help of an experienced entrepreneur who’s done it before in startups and in the enterprise, the team will attempt to move quickly, gain new insights and develop business models that deliver hyper-growth. Once the team has been formed, we will assign an EIR (Entrepreneur-in-Residence) that will be dedicated to your team and focused on helping accelerate the team’s progress using our innovation principles and process. Lean startup decision making - "closing the loop"
Contact Us Today To Start Your Intrapreneurial Journey! Successful entrepreneurship requires a lot more than reading the latest business book. It requires practice, guidance, mentorship and executive support. If you are interested in learning more, complete the form below and we will have one of our experienced EIR's contact you.